One of the greatest experiences your child will ever have is to drive an off-road motorcycle. It would have been rare to think 20 years ago, that a summer camp like this would not even exist today. But that is the reality, and this is our motivation – giving kids a chance to ride at one of the only motocross summer camps in the country. Remember the day you learned to ride a bike? You wobbled down the street or driveway with Mom or Dad running alongside yelling, “Pedal, pedal, pedal !” And then like magic, you found your balance and took off on your own. That exhilarating sense of freedom is one you never forget and can easily recapture every time you hop on a bike. That same feeling happens from the first time your child “vrooom vroooms” the throttle on a motorcycle and takes off on their own! Come try us out over Spring Break or during one of our Spring Ride Weekends to be scheduled end of March through May 2019. Many of our campers are beginners. Then, they return forever! We teach all levels. Our Ranch has a Rec Center, club house , swimming pool, motorcycle training range, motocross tracks, several trails and of course the ranch itself with our farm animals, ponds and creeks to explore. Our motorcycles are Honda CRF 50, 70, 80, 100,110, 125 and 150F off- road trail motorcycles models. We have shuttle service from Northwest Austin , snacks and drinks included. We provide everything your child needs – a great place to ride with instruction and a 8 to 1 ratio of riders to instructor. All children will go through riding orientation and will be with a coach all the time on the ranch. From our practice arena to trails and motocross tracks, safety is our first concern. Instructors are always watching or instructing. Our training curriculum is not based on competition; we teach the kids to have a fun time on the motorcycles without racing. We use an interesting mix of ranch activities during rest breaks, to get children to talk and express themselves, creating a wonderful experience for the Campers. We want all children to have a fun and safe time. We have different levels of tracks and trails to make it entertaining for all riders. We use a lot of the ranch at breaks for other activities such as fishing, exploring, playing games in the Rec center or socializing with new friends . We end every day with a video review. Children have access all the time to carts with drinks and snacks included for all riders, the Rec center with a/c and a swimming pool. Below is video of a new child learning to ride for his first time. This is after 30 minutes of what we call “motorcycle calisthenics” – exercises to get the body and hands in control of the motorcycle. This is the first drill with the motorcycle running that we preform and properly done it is non-eventful. Every child will have fun and the safety of our drills will insure their learning the correct way to ride at our summer motorcycle camp. Riding time is 20 minutes on and off. First days off time is for refreshing, water and is filled with instruction. Later days passive activities of fishing, petting farm animals to exploring ranch. This is a safety precaution that we have developed over the years that works! We have all the motorcycle fun you can have on a dirt bike. Throughout the day we have expert coaches teaching and guiding your children to become better. Half of kids that come to us don’t know how to ride and the other half think they can ride. We take them all and provide a place where kids can come and make friends, memories and enjoy the adventure of riding motorcycles. Our program is highly successful with children for our 20 minutes on and 20 minutes off riding program and good nutrition and hydration during their stay. Thanks to our highly trained coaches, we have a great safety record. To Get Into a Camp Session: 3 STEPS Click here Calendar Availability , Register and Payment We would like everyone to have a good time visiting the ranch. Your kids will make new friends while having the time of their lives. 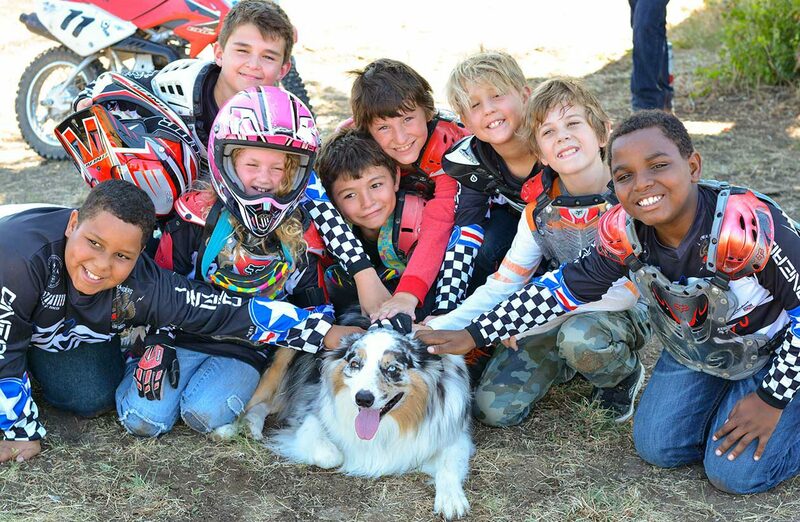 Our camp will give your child a week they won’t soon forget, at the Iron Horse Country Ranch. We may schedule open house on Sunday before summer by request. Registration and payment can be done online via credit card or mailing a check. You may pay full tuition now or Bill Pay – PayPal Service (6 month 0% plan)at sign up to hold place. Refunds only with written notice 30 days before camp start date. At Iron Horse Country Ranch there’s more than one way to get your child here – you can bring your camper right to us, or use our Bus service with more convenient Drop Off and Pick Up locations. Either way, your child will be excited to enter the Ranch Gates! If You Drive: Map Drop-off time at the Ranch is 9:30am and Pick-Up is 3:45pm. Estimated drive-time from Lakeline Mall/620 and 183 area: 35 minutes Please inform our Camp Director if you choose to drive your child to camp. If you use our Bus Transportation Service: Locations We have nice bus with a/c and TV’s -its cush! Our Bus Shuttle routes for Day Camp are in the Northwest Austin, Cedar Park, Leander and Georgetown areas. Our Cedar Park location is on our schedule every week. We offer additional locations that vary by the week. Check are Reservation Calendar for up to date locations assignments. Pick-Up and Drop-Off times may vary by up to 10 minutes. Check your welcome email letter for exact times. Cedar Park High School: 8:15am and 4:35pm Steiner Ranch Elementary School (near Lake Travis dam): 7:45am and 5:05pm Grandview Elementary School (RR620 near RR2222): 8:00am and 4:50pm Georgetown/Williams Drive/GISD Admin Bldg (near IH35): 8:30am and 4:30 pm WE WILL NOT STAFF THE TRAIN THIS YEAR – NO COACHES ON BOARD. We will just use the station below as a Pick-Up and Drop-Off place in Week 7, however we could add more weeks pending demand: The Leander Metro Station (Hwy 183, just north of FM 2243, across from the HEB Plus): 8:35am and 4:35pm If you’re considering using the Train this year, there will be no Iron Horse staff on board. It is recommended that parents ride with their children or decide if older children/teens are mature enough to ride unsupervised. We will be at the Leander Station to greet and send off our campers. You may also use this location to bring your child to the bus, if more convenient than our other locations. Camp Food – Our meal plans are as much as they can eat!